Reminder, the special MyHeritage offer for NGS members will end of Thursday, 23 November 2017. Sign up before midnight on Thursday, November 23 to get 50% of Complete Access to everything on MyHeritage. NGS occasionally partners with services that can offer our members an excellent value. Today we have arranged a great offer for our members who may be new to MyHeritage. MyHeritage is offering you a chance to subscribe to its FULL ACCESS for everything on MyHeritage for HALF THE PRICE! MyHeritage is an award-winning genealogy website that helps millions of users around the world discover their family history — and it can help you, too, achieve a breakthrough in your research. With this offer, you can access all MyHeritage features and collections for half of the normal MyHeritage Complete subscription price! Hurry, this offer is good for 7 days only! Offer expires Thursday, November 23, 2017. "I was amazed at the results. Within minutes MyHeritage.com showed me more information about a number of my ancestors than I had found in 35 years of searching on my own!" MyHeritage offers billions of records and the industry's most powerful automatic matching technologies, which “research while you sleep”. Join 91 million users who have built trees with 2 billion tree profiles. For a limited time, NGS members new to MyHeritage can join for only $125.29 for a one-year MyHeritage Complete subscription, which includes everything on MyHeritage. To get this low price, join before Thursday, November 23, 2017. That's a savings of 50 percent! 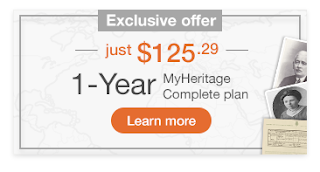 Click here to join MyHeritage today for only $125.29! Arlington, VA, 20 November 2017—The National Genealogical Society’s 2018 Family History Conference program is now available online and as a downloadable sixteen-page registration brochure. This year’s program, Paths to Your Past, will feature a full conference DNA track, an expanded African American track, and many new tracks and topics including “Paths, Trails, and Waterways” and “Occupations” and “Organizations” that developed as our ancestors left farms and moved into towns and cities. In all, the conference, which will be held 2-5 May 2018 in Grand Rapids, Michigan, will offer family historians and genealogists more than 175 lectures, an array of social events, and an expo with some eighty exhibitors. The program will begin with John Philip Colletta, PhD, FUGA, delivering the keynote address, “Coming Along the Towpath: The Erie Canal and the Peopling of the Great Lake States.” Ten lecture tracks will cover a broad spectrum of topics, including immigration and migration, ethnic groups, military research, technology, repositories, etc. Also of interest will be topics that focus on Michigan, other Midwest states, and New York, which served as a major migration route to the Midwest. Up-to-date information about the availability, amenities, and rates for conference hotels can be found on our conference website. Be sure to sign up for the NGS Conference Blog so you do not miss conference news or announcements.